Home→Uncategorized→3.5 ACRES BROWN CO. PILOTS DREAM! 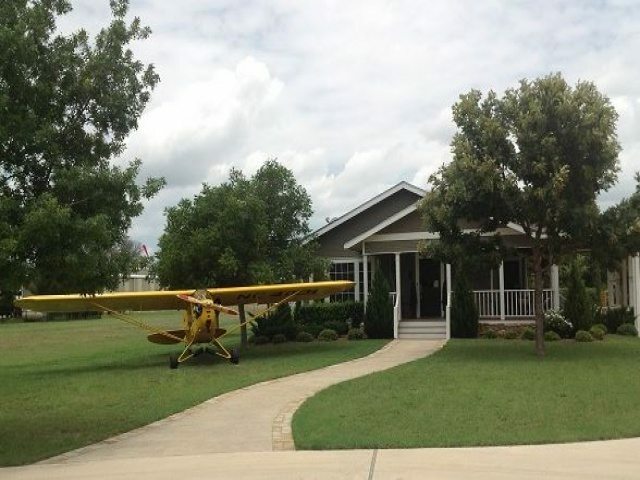 This pilot’s dream is located conveniently 7 miles from downtown Brownwood on a private, lighted runway. The home is situated on 3.5 acres and has 3 bedrooms and 2 baths with a huge pool and 60’x60’ hanger. This 1940s era home has been completely restored with character maintained. The home features 9’ ceilings throughout, original refinished pine flooring, 6” baseboards, custom paint on the walls, new paint on trim and cabinets, marble flooring and shower in the master bath, granite counter tops and stainless steel appliances in the kitchen and so much more. Walk out the back door to lush landscaping surrounding a large pool and hot tub. Three covered sitting areas surround the pool. Continue on to the World War II style hangar which can hold up to 3 airplanes. This hanger was built with entertainment in mind. It features a large kitchen, bathroom, washer/dryer/mop sink, movie room, office/bed room, 2 garages and tons of storage. There is also a tree house with bunk beds in it for the kids. You will have to see this place to believe it. For more information, call, text, or email us today. NOTE: The information contained herein is provided as general information only and has been obtained from sources deemed reliable. It is provided without any guaranty, warranty or representation, expressed or implied, made by RANCH PRO REAL ESTATE, or any related entity, as to the accuracy or completeness of the information. The information is presented subject to errors, omissions, change of price or conditions, prior sale or withdrawal without notice. Prospective purchasers should make their own investigations, projections, and conclusions concerning the information.